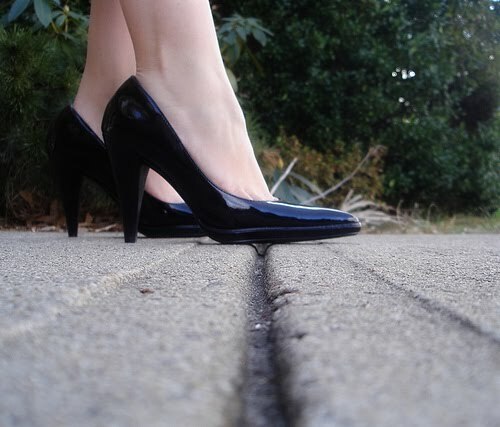 pseudoparanormal: Step on a crack break your mother's back? Everyone has heard the phrase, "Step on a crack and you'll break your mother's back." Mostly it is heard around day cares and younger children, but lately it has become a huge deal in my life. One of my roommates is paranoid about stepping on grates and manholes, she even pushes us to make sure we don't walk on them. Over time I've noticed that she doesn't even step on the cracks in the pavement or on the sidewalk. I asked her about it and she said, that when she was younger her little sister would step on the cracks as a joke, but one day her mom actually slipped and broke her arm. Since then my roommate has been extremely paranoid about the old kindergarten phrase. So I began to be curious about where the paranoia about cracks and mother's backs came form. From what I found online the superstition goes all the way back to the late 19th century and the early 20th century, back when prejudice and race was a huge issue. The original line supposedly goes, "Step on a crack and your mother will turn black." It was also common belief that if a Caucasian woman would step on a crack she would marry an African American and have an African American baby. Over time the superstition evolved to just effect children and included that if they stepped on a crack they would be eaten by bears that congregated on the street corner waiting for their lunch. Mostly likely this came about from an annoyed mom whose child kept running away to step on all the cracks. Within the past few decades though the two superstitions melded together, and became what it is today. i hate to admit it but i still do this sometimes. i never actually thought it would break my mother's back yet i still cannot avoid it. just a minor obsessive-compulsive habit of mine i guess.